WASHINGTON, D.C. -- Although the Dow Jones industrial average has made significant gains since it plummeted in 2009 after the financial meltdown, Americans are no more likely today than they were six years ago to report having money invested in the stock market. 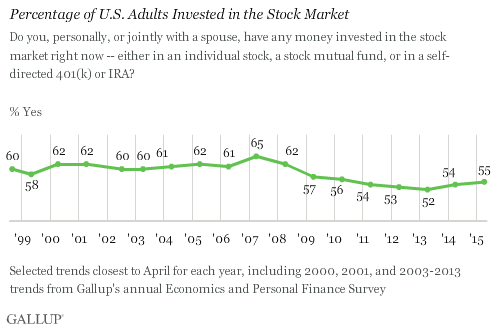 Fifty-five percent of Americans report having money invested in stocks, matching what Gallup found from 2009 through 2011, though up slightly from the low of 52% in 2013. While stock ownership fell among all age groups between 2007 and 2010, it has since rebounded some among young adults between the ages of 18 and 34, reaching 49% this year -- up from 41% in 2010. 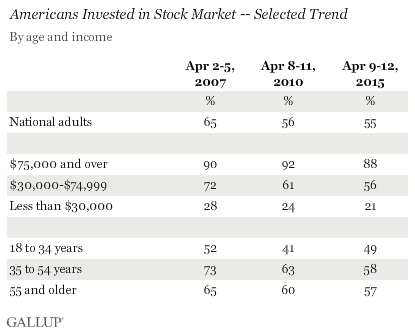 But for the 35 and older groups, percentages of those invested in the stock market continue to drop. Other demographics have seen a shrinking percentage of investors since before the financial crisis, with the exception of young adults and those in households earning more than $75,000 annually. The financial crisis did not appear to have had much of an effect on whether these wealthiest Americans chose to invest in the market. Perhaps consistent with that, the Wells Fargo/Gallup Investor and Retirement Optimism Index finds that U.S. investors with $10,000 or more in invested assets -- a wealthier-than-average group -- is relatively bullish on stocks right now with 58% saying it is a good time to invest, up significantly from 2011. While the stock market has made significant progress in recent years, the upward trend hasn't lured more Americans back into the stock market following the outflow seen after the 2008 financial crisis. It is understandable that investors were spooked by the big losses in stock values that occurred after the financial crisis, and many have likely decided the risks in stock investing are too great -- and have chosen to invest their money elsewhere. Results for this Gallup poll are based on telephone interviews conducted April 9-12, 2015, on the Gallup U.S. Daily survey, with a random sample of 1,015 adults, aged 18 and older, living in all 50 U.S. states and the District of Columbia. For results based on the total sample of national adults, the margin of sampling error is ±4 percentage points at the 95% confidence level. All reported margins of sampling error include computed design effects for weighting. U.S. investors who have access to a 401(k)-type plan at work say offering meetings with a financial professional is the best way employers can help them manage their retirement plans. Written communication ranks lower. Before the Federal Reserve recently indicated it may start raising interest rates, most U.S. investors already thought rates would go up. Some say higher interest rates might cause them to replace stocks with safer investments.